The leaders of Russia, Ukraine, Germany and France have agreed on a "road map" aimed at reviving the stalled peace process in eastern Ukraine. But details of the plan still need to be worked out by the countries' foreign ministers over the coming month. German chancellor Angela Merkel had invited presidents Vladimir Putin of Russia, Petro Poroshenko of Ukraine and Francois Hollande of France to Berlin for the first four-way talks in over a year, insisting that while major progress was unlikely it was important for top-tier negotiations to continue. "I'm convinced it was right to reopen the channel of talks at this level again," Mrs Merkel said after the meeting. She conceded that the four "didn't achieve miracles" but maintained the talks were necessary "in order not to lose momentum". 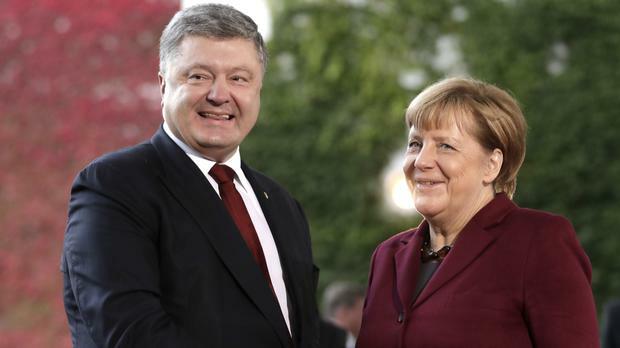 Also discussed was the creation of so-called disengagement areas to separate the warring parties, as well as measures to improve the humanitarian situation in eastern Ukraine, Mrs Merkel said. Ukraine's president said an agreement had been reached that the road map should be adopted by the end of November. Mr Poroshenko was quoted by Russian news agencies as saying it would include all security issues, including restoration of Ukraine's control of its entire border with Russia. The road map is part of an effort to implement the so-called Minsk agreement of February 2015 on ending the conflict, in which more than 9,600 people have been killed. Mr Poroshenko was also quoted as saying that an agreement was reached on the deployment of an armed police mission in the areas held by pro-Russian separatists. But Mrs Merkel told reporters that such a step would first require Ukraine to pass laws for local elections in the disputed territory, something Kiev has not yet done. The Organisation for Security and Co-operation in Europe said in May that it would consider sending a mission to help conduct elections in the separatist east. The 2015 Minsk agreement brokered by France and Germany has helped end large-scale battles between Ukrainian troops and separatists, but clashes have continued and efforts to reach a political settlement have stalled. The decision to hold the meeting in Berlin follows a flurry of telephone diplomacy over the past week. Outside the German chancellery, hundreds of demonstrators staged competing rallies as the four leaders arrived, including a group of about 30 people waving Russian and Soviet flags chanting "Thank you Putin". Nearby, larger groups of Ukrainian and Syrian protesters demonstrated against the Russian president.